On a cold December day in California, I decided to set up an indoor layout for my G-scale model trains. It was too cold to have any doors open to route the trains out to the yard, so I just made a layout throughout the house and in to the garage. This video features the longest freight train I’ve ever run on my layout…. 16 cars behind my Santa Fe diesel locomotive. 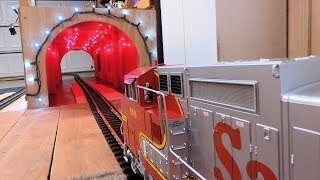 If you’ve watched some of my other model train videos before, you probably also noticed something I’ve never featured before… the red tunnel! That was definitely my favorite part of this new layout. By the way, I’m not one of those G-scale guys that wants to build a permanent layout out in my garden. For me, the most fun part of playing with model trains is creating a new, different layout each time I set the trains up. And, in case you’re wondering, my house doesn’t have trains running through it like this all the time! This layout you see in this video existed for just two days before I put it all away again. I love the challenge of making a new layout each time. During warmer weather, the trains go out the doors and in to the yard, too. The Santa Fe diesel locomotive shown in the video was manufactured by MTH trains, and so was the Amtrak locomotive. Thomas the Tank Engine was manufactured by Bachmann, and the Coca Cola train was made by LGB. The Amtrak train and the Coca Cola train were manufactured in limited quantities and are impossible to purchase in new condition anymore. The Santa Fe diesel locomotive was also manufactured in limited quantities… but there are still a few available for sale. Let me know if you’re interested in buying one… I can point you in the right direction. Most of this video was shot using a GoPro Hero 7 Black camera, using the camera’s built-in image stabilization in lieu of a gimbal. A few shots were made with a Canon DSLR.